T-cell acute lymphoblastic leukemia (T-ALL) constitutes an aggressive subset of ALL, the most frequent childhood malignancy. Whereas interleukin-7 (IL-7) is essential for normal T-cell development, it can also accelerate T-ALL development in vivo and leukemia cell survival and proliferation by activating phosphatidylinositol 3-kinase/protein kinase B/mechanistic target of rapamycin signaling. Here, we investigated whether STAT5 could also mediate IL-7 T-ALL-promoting effects. 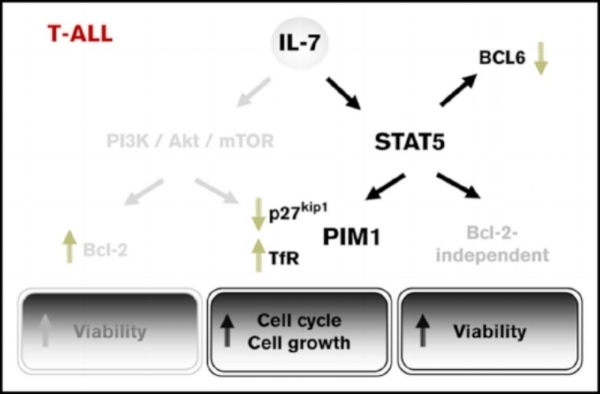 We show that IL-7 induces STAT pathway activation in T-ALL cells and that STAT5 inactivation prevents IL-7–mediated T-ALL cell viability, growth, and proliferation. At the molecular level, STAT5 is required for IL-7-induced downregulation of p27kip1and upregulation of the transferrin receptor, CD71. Surprisingly, STAT5 inhibition does not significantly affect IL-7–mediated Bcl-2 upregulation, suggesting that, contrary to normal T-cells, STAT5 promotes leukemia cell survival through a Bcl-2-independent mechanism. STAT5 chromatin immunoprecipitation sequencing and RNA sequencing reveal a diverse IL-7-driven STAT5-dependent transcriptional program in T-ALL cells, which includes BCL6 inactivation by alternative transcription and upregulation of the oncogenic serine/threonine kinase PIM1. Pharmacological inhibition of PIM1 abrogates IL-7–mediated proliferation on T-ALL cells, indicating that strategies involving the use of PIM kinase small-molecule inhibitors may have therapeutic potential against a majority of leukemias that rely on IL-7 receptor (IL-7R) signaling. Overall, our results demonstrate that STAT5, in part by upregulating PIM1 activity, plays a major role in mediating the leukemia-promoting effects of IL-7/IL-7R. This work was a collaboration with the Barata Lab (IMM, Lisbon) and has been published in Blood Advances.